The Story is based off an interview with Pase John and multiple conversations with Dr. Beth, as well as, some of my first person account. 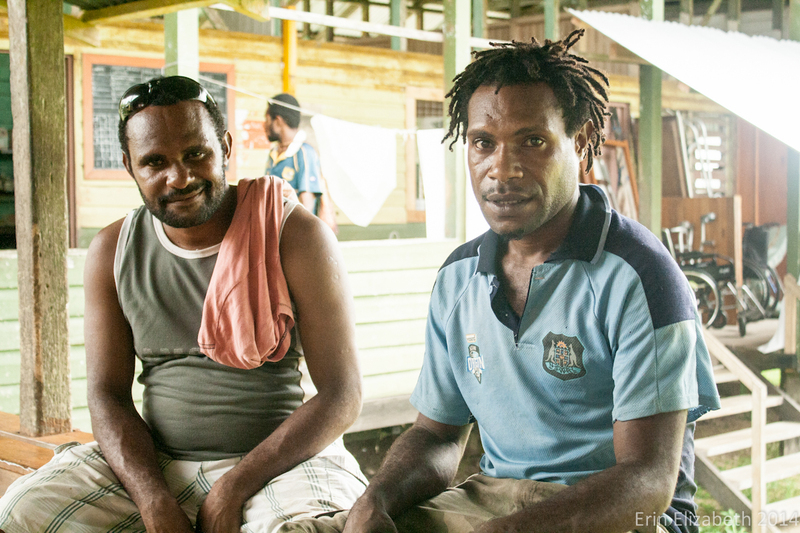 After unemployment had left Pase John unable to properly provide for his family, he left Lae in Morobe Province. As he searched, Pase was led to the Gulf Province where he found a temporary job with an oil and mineral company building bridges. The labor was hard, but he was happy to work for his wife and young children. A gentle smile crossed his serious face when he talked about his small boy and baby girl. A sadness shown in his eyes, as well. He had not been in contact with them for months. It was hard to stay in touch when he was at his work camp in a remote area. Laboring on the bridges a few months, the days wore into weeks and life was in a bit of a rhythm with nothing much changing. Then what started as an ordinary week of hard labor, changed dramatically as he began to feel weak. Weaker than his usual fatigue. Both of his upper arms were losing strength at an alarming rate. That night, he tried to rest well. When he awoke on the Wednesday morning and got out of bed, his arms remained limp and now his legs were being drained of all strength. Pase, like many Papua New Guinean men, was not tall but he had an imposing strength. His lean muscle indicated a life of demanding toil. Doubts flickered through his mind as the extreme exhaustion came on. He knew something was wrong; this was beyond pure weariness. He alerted the base camp medic, who brushed off Pase’s concern. After a brief medical examination, Pase was sent back to his bed. Pase awoke in the night with a terrifying revelation. Try as hard as he could, he could not move a muscle. Although he could talk, he was completely paralyzed. Panic set in as he called for help. By the time the medical staff was alerted, they were sure Pase was dead. His heart rate was barely registering. Not a muscle moved. That morning, they rushed him to their base camp in Tuel where they attempted to stabilize the dying man. Isaac Anley, the base paramedic, took over. He knew there was not much they could do and they needed to get Pase to a hospital as soon as possible if saving him were even feasible. With the helicopter blades rotating swiftly overhead, Pase was strapped in with Isaac by his side. 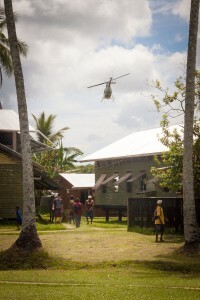 They took off and made the couple hour flight via chopper to the bush hospital in Kapuna. Mid-Thursday morning the Kapuna staff had done their rounds in the wards. Many of them were sitting in the living room of Dr. Lin, Grandma, enjoying devotions. The singing had ended and it was more of a time of conversation when the tale-tale resonance of a distant helicopter broke the normal jungle noises. It was the second helicopter to arrive that week. The doctors had been busy the past few days with an influx of severe Tuberculosis patients; although this was a fairly normal state for Kapuna hospital to be in. As the helicopter broke through the dense grey clouds in the morning sky, they knew there was likely another emergency to handle. Since most patients – even extremely sick ones – usually arrived via canoe or dinghy, flights in are reserved for many of the worst cases. The staff dispersed from their devotions and headed to the pad that sat amidst the swampy grasses in front of the hospital. Patients, families, students all came running, clamoring close enough to see the metal beast with its swiftly rotating arms. Isaac jumped out. Aided by staff, he carried Pase into the hospital. The doctors were at a loss as to why a healthy, 26-year-old man would wake up completely paralyzed with a diminishing heart rate. ECG’s showed the heart rate was at risk of completely stopping. After a round of checks and basic diagnostic testing, Dr. Valerie and Dr. Beth diagnosed low potassium and treated to stabilize him. Then they, and even retired Dr. Lin, went off to consult every resource to figure out why it was so low. Haunted by the terrified gaze of the dying man, they prayed as they worked. As research and reading ensued, the three women came back together to discuss their findings. Dr. Beth found the diagnosis in books, and Grandma reminded Valerie that she had seen it once before as a student. (What a wonderful memory 89-year-old Dr. Lin has!) All of them had come to the same diagnostic conclusion: Shakhonovich’s syndrome… Hypokalaemic periodic paralysis. It was the only diagnosis that made sense with the failing heart rate. The disease is genetic and very rare, usually showing itself in adolescence. Potassium, which helps muscles and maintains the heartbeat, does not transfer properly between membranes. This causes extreme muscle weakness when potassium levels drop or in extreme cases complete paralysis. If not treated timely the heart can stop. The other risk of the disease is that recovery is quick and almost instantaneous. The sudden high potassium in the blood adversely affects the heart rhythm and can cause fatal arrhythmias. The patient has to be closely monitored to ensure this does not happen. Days later, Pase was asked what was going on in his head while all of this was happening. He said initially terror. He did not think he would ever see his family again. Due to the remoteness and suddenness of his illness, his family was completely unaware of his condition throughout the ordeal. He said once he was in the care of the doctors, could sense their concern, and had all of the tests running, his fear eased a bit. He knew they were doing everything possible for him. Slowly they watched his heart rate improve with the potassium treatment. Thursday felt like an eternity in the eyes of Pase and the staff at Kapuna. By Friday morning, Pase was more assured by the doctors. Isaac never left his side, as he interpreted the English into Tok Pisin for the young man. Monitoring him closely in case his heart rate spiked, the waiting game for his sudden recovery began. Friday evening Dr. Beth did her usual rounds. While checking on Pase, he complained to her of pain in his chest. She prayed it would not be something worse and asked him where his pain was located. Without thinking, he lifted his hand and pointed to the source of the pain. Dr. Beth, Pase, and Isaac all realized in that moment Pase was recovering. Pase could move his hand and arms. His feeling and strength were returning. Overjoyed, they waited breathlessly to see how much he could do physically. In less than an hour, the patient sat up and swung his legs over the edge of his bed. With shaky steps, he began to walk across the room. After monitoring his heart to make sure it was stabilized, Dr. Beth left her healed paralysis patient in joy and informed Dr. Valerie and those around the hospital of his recovery. Face alight, she came to us friends, to inform us of the miraculous healing. Our cheers could probably be heard a long way off. We all knew it was moments like this that kept the medical staff going. It made the hard work and sleepless nights worth it. It’s not every day a person can say they saw a paralyzed man get up and walk. The staff at Kapuna can. Thanks to the hard work of a dedicated medical staff, the wisdom of God, and the determination of a man to live! The faithful paramedic, Isaac, and Pase John the day he was released from the hospital. Walking!